The coolest but often most challenging piece of work for undergraduates is their final year dissertation – a 10000 word paper based on their own research , conducted under supervision of a member of academic staff. The hardest part of this process often comes at the beginning. Students need to find a research question and a method of answering that question that stands up to scrutiny. One of the most difficult challenges in research is taking the questions and hunches we have about what is going on ‘out there’ in the world and turning them into research proposals – that is focused, methodical approaches to understanding the conundrums of social and political phenomena. We start out like children in a sweet shop. We want to consume all the information we can get but this would take too long and if we just try to stuff our face the conclusion won’t be much to look at anyway! At Southampton from the beginning we work closely with students to guide their research and we have introduced numerous teaching innovations to our second year methods module that I convene with @jmrphy to help them along. Academics regularly use posters as a medium to communicate their research at conferences. They are an extremely useful and undervalued tool – they force the researcher to think carefully about how their research should appeal to an audience that is not captive (it is easier to move past a poster than walk out of a presentation). They also discipline us to think about how research can be communicated and understood quickly and easily. 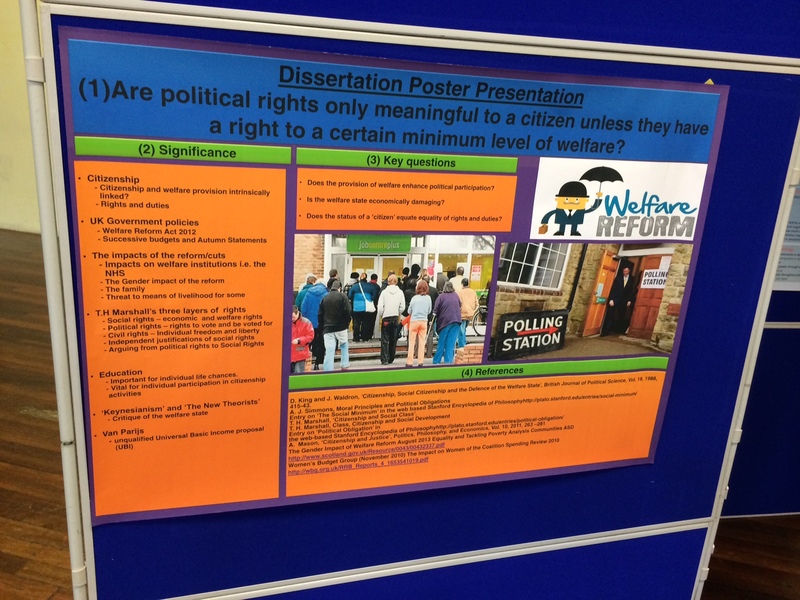 This year, developing a great idea first shared by @Alison_statham at DMU (see here), we asked 2nd year students to design a poster to communicate their research proposals. 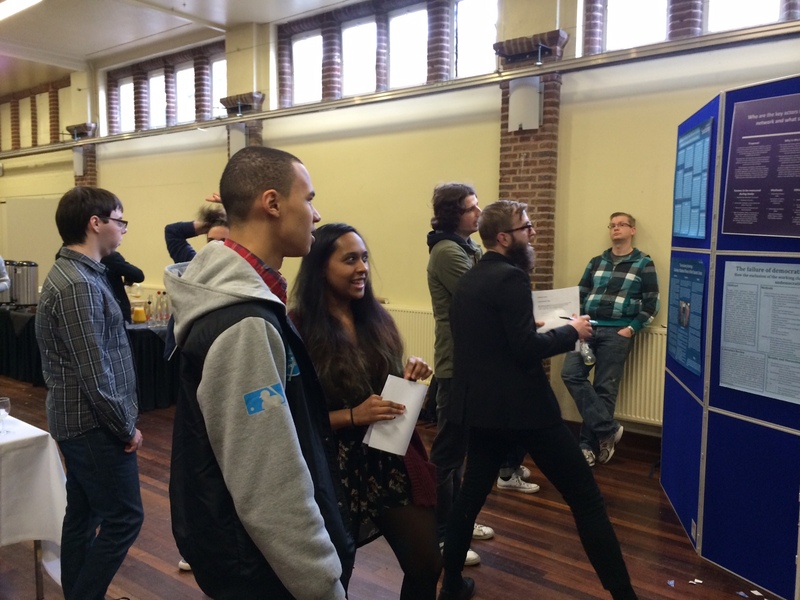 On Wednesday we held a special event where they presented their posters to their colleagues (students and us staff). There was a great buzz of excitement and a superb collegiate atmosphere with students and staff feeding back to one another on research plans. We were really impressed with our students work. We certainly found that students were inspired to be creative, adding a bit of personality to their research, but also they were a lot more focused in communicating logical approaches to social inquiry. It is always a great challenge even for experienced researchers to guide students through what can be a challenging process but a very rewarding one when we see the quality of their work.